Here was the reality – her checking account balance was less than $100. Here was the perception – her future was shattered. That’s how Charlotte Diehl described the start of a life that took sharp turns down a twisting road. That road could have taken her any number of directions – even to a dead end. But instead, Diehl ended up at IU Health University Hospital where she warmly cares for patients at the Women’s Hematology/Oncology Clinic. Diehl, 28, was born and raised in Fremont – a town in the northeastern Indiana county of Steuben populated by just over 2,000 residents. The area is known for an annual summer music festival, a picturesque state park, and the Fremont High School eagles. And like an eagle, Diehl graduated from high school in 2007 determined to soar. She packed her bags and moved south where she enrolled in East Tennessee State University. Her focus was on a career in nursing. But the path took another turn when her grandfather died of complications from lung cancer. But the timing wasn’t right. “I felt pressure to succeed and I was unsure of myself. It’s like I just wasn’t prepared to live on my own,” said Diehl. So she moved back to Indiana, enrolled in a few classes, and worked in retail. She also met a guy who became the father of her child. As she talks, Diehl blots tears from her cheeks. Some are tears of disappointment for a relationship that didn’t work out. Some are tears of gratitude for the people who support her and her daughter now. Three years ago, Diehl said her older sister “took a leap of faith” and invited Diehl and her daughter to move to Indianapolis. “My sister worked as an inpatient social worker at the hospital and her husband was an RN. They didn’t have children at the time and they asked us to move in with them,” said Diehl. Looking back, Diehl realizes it was also a leap of faith on her part. For the next year, Diehl and her daughter lived with Caroline and Aaron Lipp. She got a job working 6 p.m. to 5 a.m. and began to map her future. “My whole focus was to be a good mom and get back on my feet. I couldn’t have done it without their help,” said Diehl. It was her sister who suggested Diehl revisit her original goal of working in healthcare. In high school Diehl had obtained certification as a nursing assistant. It was a start. Three years ago, she quit her night job and started working at IU Health as a patient caregiver in oncology. A year later she started nursing school. In addition to going to nursing school, she moved out on her own (just 15 minutes away from her sister), purchased a vehicle, and continues to serve as the primary caregiver for her daughter who just turned five. She recently completed a five-month, five-hour Saturday class that left one day a week clear. Most weeks Diehl’s schedule includes waking up early, dropping her daughter at daycare, heading off to the hospital, picking her daughter up from daycare, preparing dinner, and playing and reading with her daughter before bedtime. Then Diehl studies before she heads off to bed and starts the routine over again – a discipline and determination that landed her on the Dean’s List. “The nurses and co-workers here have been so encouraging. They’ve helped babysit, and always remind me I can do whatever I want to do. 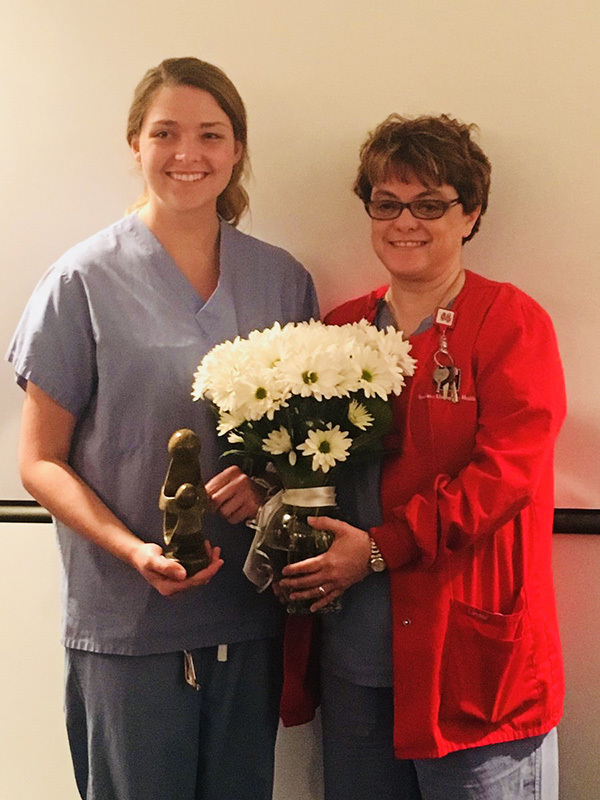 No matter what the circumstances I’m in, I can better myself,” said Diehl, who utilizes IU Health’s tuition reimbursement to fund her education. — By T.J. Banes, Associate Senior Journalist at IU Health. Reach Banes via email at T.J. Banes or on Twitter @tjbanes. That’s how Tony Davey, a nurse practitioner at IU Health University Hospital chose his first college major. He’d been out of school for about four years when he decided he’d return for a degree in nursing. “My sister was in nursing school at the time and she recommended it,” said Davey, who grew up on the northeast side of Indianapolis, the second oldest of six. He started at IU Health in 1985 in renal ICU and returned to school to obtain a master’s degree in marriage and family therapy. He continued his career in psychiatric nursing and eventually ended up in a management role. Working in management also made Davey aware of his interest in bedside care and helped him recognize his passion, he said. 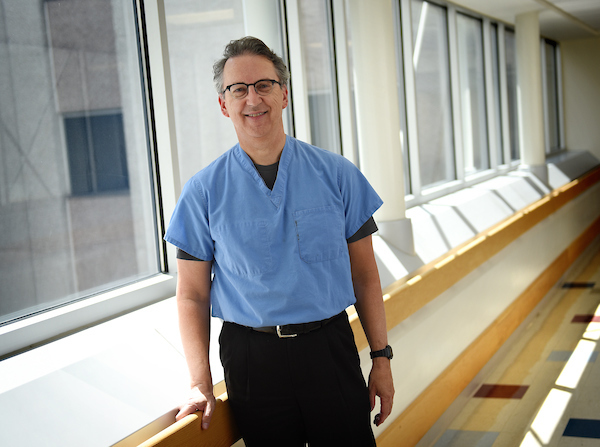 He went back to school to become a nurse practitioner and began working with transplant patients. “Transplant is very gratifying. People come in very sick and several months later you’d never know they were in the hospital. It gives them a new lease on life, new energy. I love the staff, the nurses and surgeons I work with,” said Davey who starts most days at 6:30 making rounds at University and at Riley Hospital for Children. “I don’t know exactly why but I’ve really enjoyed working with the pediatric program. I just got called to put in labs on a patient who came in as a baby and is now 12,” he said. Davey smiles as he talks about one of his most memorable patients – a man in his 40s, who was not easily calmed. Davey and his partner of 23 years purchased and restored a former Indiana Bell building in the historic Meridian Kessler neighborhood. He loves to entertain company and cook – especially ethnic foods and savory dishes. He was a gymnast at North Central High School. He swims most mornings at 5:30 a.m. and has practiced yoga for 30 years. He still loves to read – especially science fiction. Mark Taylor was 18 years old, had just graduated high school and really wanted to land a job at Methodist Hospital. Every week, he’d drive from Mooresville to Indianapolis to check in. Any openings? Any jobs? Anything coming up? He walked into Methodist as a surgery orderly, taking patients to and from surgery. That was October of 1972 – 45 years ago. It was tough to get on at Methodist, all those years ago. It was a coveted place to work, but Georgette (George) Spitzer had proven herself. After working as a unit secretary at another city hospital, she was hired at Methodist in 1985 to work in critical care as a unit secretary on nights. Within months, she was moved to neuro critical care as unit secretary on days. She brought compassion, kindness and order to the units. When an opening arose for an equipment and supply coordinator in late 2001, Spitzer applied and landed the job. She’s given 35 years to Methodist. “We’re the type of employees you can’t get rid of,” she says. And nor would the hospital want to. Judi Jacobi-Mowry, a critical care pharmacy specialist at Methodist, calls Taylor and Spitzer irreplaceable. Both are set to retire within 12 to 18 months. Taylor’s and Spitzer’s jobs are to make sure all specialty supplies and equipment are stocked in critical care units – cardiac and neuro. Tubing, pillows, bed trays, IV poles, EKG cables, chairs in rooms, transport monitors, the list goes on and on and on. They take inventory each day and order thousands of supplies and pieces of equipment each year. They also are responsible for repairs of equipment, too. “And if we don’t know, we know who to call,” Spitzer says. Looking back, on the 80 years between them, would they do it all over again? “Yes. I’d absolutely do it all over again,” Spitzer says. And what’s the best part about their jobs? Making a difference, they say. “Just making sure the patients have what they need,” Taylor says. Putting your kids to bed, and getting them to sleep, can sometimes be an arduous task. But there are ways to encourage a peaceful night’s rest. First and foremost, what’s the right amount? • Newborns 0 to 3 months — 10.5 to 18 hours per day on an irregular schedule. • Infants 4 to 11 months — 9 to 12 hours per night plus frequent naps during the day. • Toddlers and preschoolers 1 to 5 years — 11 to 14 hours per night, including some napping. • School-aged 6 to 13 years — 9 to 11 hours per night with little to no daytime napping. While these are general guidelines, it’s important to note some age-related specifics. Newborns do most of their sleeping during the day and are awake through most of the night. At approximately two to three months, that pattern starts to reverse; however, don’t expect your infant to go without a short nap about every two hours until he or she reaches six to nine months of age. Around two to four years old, your child may only be napping twice a day, but napping may disappear entirely around age five. This pattern continues throughout late childhood. Teenagers, however, do not typically get enough sleep, which should be around eight to 10 hours per night. This can be due to texting or talking on cell phones and staying up late. In addition, bedtimes can be irregular. Getting your kids to sleep. Infants — Preparation for bedtime may include rocking, feeding, and swaddling. Learn to recognize sleep cues and put them to bed when they begin to get drowsy, not after they’re already asleep. This helps them learn to put themselves to sleep. And it’s okay to let them cry for 30 minutes to an hour; infants need to learn to self-soothe. Check in on them every so often, but resist the temptation to pick up and coddle them to sleep. Lay them on their backs in a crib with nothing but a swaddling sack or sheet — no toys, extra blankets, or crib cushions. Make sure sheets are tucked below the arms. Do this until they’re able to roll over completely by themselves, from front to back and back to front. Two to eight years of age — Establish a time and routine for going to bed. This can include bathing, brushing teeth, putting on pajamas, and reading a story. Also, establish a routine wake time. Kids respond well to an expected regimen and will sleep more predictably. Thunderstorm, bad dreams, or overactive imagination? Try to avoid letting your kids sleep in bed with you at all costs. Once you provide that option, it could become a habit that’s really hard to break. Instead, go to their room for a few moments to reassure that there’s no boogeyman in the closet. Preteens and teenagers — In addition to maintaining a bed- and wake-time routine, make sure they’re getting plenty of exercise and are eating nutritiously. Try to restrict sugar and caffeine intake and napping from late afternoon on. The cold and flu don’t have to derail your winter. The key is taking preventive measures and knowing how to respond when you do feel under the weather. There are many overlapping symptoms between the common cold and the flu. So how can you distinguish? It boils down to the severity of the symptoms and their duration. A cold may be uncomfortable, with the sore throat, constant sneezing, and runny nose, but the flu will include body aches that make you feel like you’ve been hit by a train. The flu will also knock you down for about two weeks, while a cold can be licked in two days. First, a daily vitamin supplement does not protect you from the cold or flu. You may be able to lessen the severity once you catch something, but supplements do not prevent you from contracting it. Second, you can’t catch a cold simply from being cold or going out with wet hair. The cold and flu are caused by viruses and bacteria that you have to come in physical contact with, through touch or airborne particles. Avoid others who are sick. Wash your hands regularly. Sneeze into your elbow or shoulder, not into your hands. Getting plenty of rest will help keep your immune system ready to respond when it is needed. Vigorous activity has been proven to raise the body’s T cells, a type of white blood cell that fights off infection for six to eight hours at a time. Working out for 20 to 30 minutes first thing every morning can boost your immune response for the rest of the day. Last but not least, get an annual flu shot. You may have received a flu shot in the past and still caught the flu. That’s because flu strains are always changing, and we’re making our most educated guess as to what the three or four most common strains will be each year. Sometimes we miss the mark slightly, so the shot isn’t as effective. But the benefits are cumulative as you are exposed to more and more strands over time. That’s why you want to get a flu shot every year. If you think you have the flu, see your physician as soon as possible. He or she can prescribe medication to combat it if you’re seen within the first 48 hours. If you catch the common cold (and you don’t have other health issues), there is no point in going to the doctor. The best remedy is to rest and drink plenty of fluids. Take Tylenol or Advil for pain and fever, Mucinex for congestion, and a spoonful of buckwheat honey for coughs. Antioxidants found in some natural foods, like tomatoes, help round up free radicals, resulting in faster recovery. Finally, do yourself and your coworkers a favor by staying home from work, please. Unfortunately, we live in a culture that values attendance over productivity, but we need to challenge that stigma. If you rest and take care of yourself at the onset by missing one or two days of work, you’ll get well and be fully productive a lot sooner. That’s much better than struggling through only to get worse and miss three or four days later. More importantly, colds and flu are highly contagious, so staying home limits your exposure to others. Please feel free to contact either your family physician or me if you have concerns. Have a healthy and happy winter. All they want is a little bit of news. They want a connection – to feel like they are near their loved one – even when they aren’t. Family members sit sometimes for hours, wrapped in blankets, sipping warm coffee, watching the television screen, texting and talking on their phones. Sometimes they drive hours to get to the hospital. They may catch a little nap or get a bite to eat, but for the most part they wait. And while they wait, Rebecca Findlay pops into surgery and then to the waiting room where she gives family members bits and pieces of news about their loved one. She covers three waiting rooms and makes rounds every two hours – sometimes more. “I say I’m the rat in the maze. I have sticky notes to keep me focused and I have a set path – through surgery, through recovery rooms, then to waiting rooms, then other surgery rooms and recovery,” said Findlay. The routine quickly satisfies her goal to stay fit. Findlay was a newly divorced, single mother of two, when at the age of 30 she decided to enter nursing school. Her daughter was 12 and her son was 10 when she finished her degree. Her first job was working in cardiovascular critical care at Methodist Hospital. She eventually made her way to surgery, pre-op, and recovery. In 2001, around the same time as 9/11, Findlay learned of a program that focused on holistic patient care combining mind, body and spirit. Within no time at all, she found her career niche. She attended a parish nursing program through the University of Indianapolis. The program requires that the prospective participant be a registered nurse with at least two years of experience, and is sponsored by a healthcare organization. Shortly after she completed her training, the position at University Hospital opened up and Findlay has remained there for the past 13 years. “I never dreamed that this biggest and longest piece of my nursing career would be talking to people, but that’s what I do,” said Findlay, who remarried 22 years ago and is now a grandmother to three. It’s difficult for her to describe a “typical” day just as it is difficult for her to describe a “typical” family. She treats each person as if they are her only family member of the day. The toughest part of her job is notifying families when a situation becomes dire. In her soft-spoken manner, she approaches family members and says: “I have some information that may generate some questions.” She usually takes them into a consultation room and delivers the most up-to-date news. The words are always painful for Findlay. They never get easier over time. Sometimes they ask for a chaplain or prayer; sometimes they ask for help contacting other family members. But almost always, they are grateful to have someone who gives them the most up-to-date information, someone who acts as the patient’s voice. The holidays are upon us, which means ’tis the season for baking. However, if you only use your holiday spices for cakes and cookies, you’re missing out, says David Pletzer, MD, a family medicine doctor at Indiana University Health. “Doctoring up your food with spices can be a great way to add a lot of flavor and sneak in some health benefits,” he says. Here are five superstar holiday spices—and ideas on how to use them. This anti-inflammatory spice is a health-boosting powerhouse, with research showing it can do everything from help ward off colds and keep blood sugar in check to lowering “bad” cholesterol. Spice up … your next bowl of oatmeal. Add a dash of cinnamon to your oats to add a rich flavor and help stave off mid-morning cravings. Having trouble sleeping? This healing spice has been shown to induce drowsiness. It’s also anti-inflammatory (which can reduce your risk of chronic disease), and can help regulate your digestive tract to ward off woes like indigestion and diarrhea. Spice up … your next cup of herbal tea or warm milk to give your nightcap a health boost. Turns out the iconic candy cane is much more than a holiday treat: Peppermint has been shown to quell an upset stomach, relieve headache pain, and soothe irritable bowel syndrome (IBS) symptoms. Studies show it also enhances brain function, boosting concentration and memory. Spice up … your breath. Simply sucking on a peppermint candy will not only freshen up your breath, but it may also give you a boost of alertness. This antioxidant-packed spice contains eugenol, which some research has shown to be an effective anti-inflammatory—which helps do everything from reduce aches and pains to help ward off chronic disease. Spice up … your soup. Make your go-to veggie soup even more nutritious by including a teaspoon of this disease-fighting spice. There’s a good chance you’ve been turning to ginger (in the form of ginger ale) to ease stomachaches for as long as you can remember. That’s because this spice is proven to calm nausea. Researchers think it’s because ginger root contains pungent phenol compounds, such as gingerols and shogaols. What’s more, it may also help relieve arthritis pain and swelling, as well as migraine headaches. Spice up … your salad dressing. Add a teaspoon of ginger (or more, depending on your taste preference) to your next homemade dressing to give your greens a zing. Mollye Banks was in Middle School faced with the angst that many teenagers face – wondering, “what do I want to be when I grow up?” She could hear her mother’s words playing over in her head as she attended a Junior Achievement Career Fair. Sylvia Keys frequently told her four children: “The key to success is education. You never stop evolving. When you want more, strive to get more.” A nurse who worked at a Louisville Hospital, Keys was big on education. Banks raised her two sons with the same philosophy and it has served them well. One is a hotel chef and the other is completing his master’s degree. Born and raised in Kentucky, Banks says that experience at the career fair set the course for her future. She combined her mother’s words of wisdom with a medical path that brought her to IU Health where she works as a supervisor in sterile processing. She recently returned to the Junior Achievement event as a hospital volunteer to share her career experiences with other eighth graders. When the girl still expressed doubt, Banks told her about the first time she helped deliver a baby in the operating room. “I put that new life on his momma’s belly and I knew then and there I was in the right profession.” After she finished the story, the young student left the room but she ran back before she left the career fair for the day. She asked Banks more questions. “I felt good because I knew I had touched at least one young life,” said Banks. She practices that same philosophy with her coworkers – encouraging them to excel in their careers and be the best they can be at their jobs. “I try to promote education. If someone wants to do some in-service training, or take their career to another level, I’m right behind them,” said Banks, who is also an instructor for the hospital’s sterile processing certification program. She relates how one of her co-workers obtained her nursing degree and an environmental services employee is now working as a surgery technician. It’s rewarding to get hugs and ‘thanks’ and to know that I had a tiny part in helping them find their way,” said Banks, 54. Much of that encouragement comes from Banks’ heart – learned through life experiences. She completed her training at Jefferson Community College in 1991 and in 1999 she moved to Indianapolis to give her youngest son a fresh start. “He was struggling with mental issues and didn’t have many friends. He was treated at Riley Hospital,” said Banks. She started working at Riley and eventually transferred to University Hospital. The mother was anxious and nervous and scared. She told labor and delivery nurse Jeanine Blom her fears. The birth of her first child had been traumatic. The baby’s shoulders were stuck during birth. The epidural didn’t work. As that mother lay at IU Health Methodist Hospital on Christmas Eve last year, ready to give birth to her second child, Blom was determined to make this birth a wonderful one. But the story doesn’t end there. Blom felt a connection to this mother and her baby. And even though her shift was over, she stayed late on Christmas Day to be with her. “I wanted to ensure she and her family had a good end to their labor and delivery experience,” Blom says. So, she stayed until they were transferred to the Mother Baby unit. It’s no wonder, in her short time at Methodist, Blom has become known as a standout labor and delivery nurse. She is respected by her peers, has won awards for her care and is beloved by her patients. What makes a standout nurse? It started at the gas station. No pun intended. No joke. It started at a gas station – the kind with fuel tanks and monstrous fountain drinks and bags of chips. It was last Saturday morning, a bright and sunny day. I was pumping gas when I looked through the back seat window and saw my sons’ basketball bags sprawled amid loose gum wrappers. And a 24-pack of water bottles spread out in disarray. I pushed auto click on the gas nozzle, grabbed the backseat intruders and headed to put them in the trunk. As I stepped over the gas hose, my foot got caught, I tripped and I crashed face forward to the cement. I went down with a loud, blood-curdling screech. People came rushing over. I’m fine. The gas hose is fine. The water bottles and gym bags are fine. The people looked embarrassed for me as I gathered myself up and tried to feign cool. Once in the car, I texted my mom to tell her what had happened, which she relayed to my dad. And he had an enlightening theory as to what prompted my fall. It was scheduled for Wednesday. I was nervous and dreading it. Perhaps that had turned me into a nervous klutz. But then, my mind started swirling, doing a lot of statistics involving the number two. What are the odds? 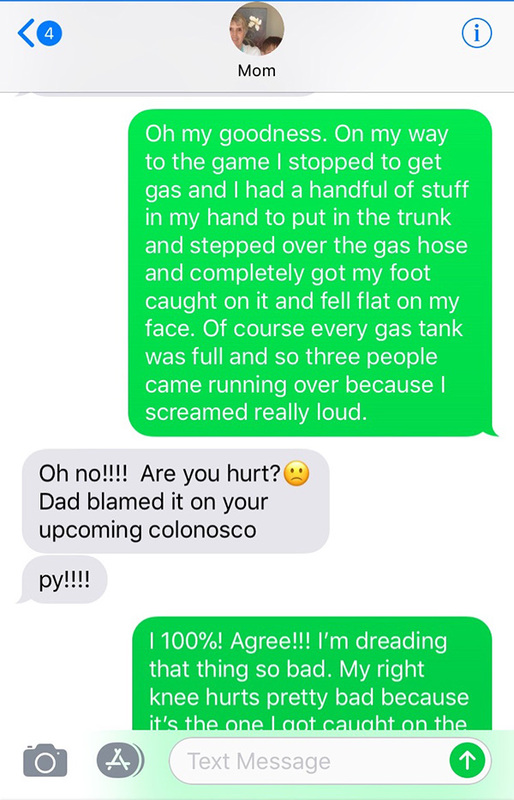 What are the odds that five days before my first colonoscopy, I had a terrible incident involving gas? An encounter with a hose that looked uncannily like what I imagined would be probing my lower innards. Yes. This surely had to be a sign of what was to come. That’s what happens, I’ve found, with people who are getting colonoscopies. The myths and the conspiracy theories and the superstitions start floating around in their minds. I’d heard plenty of them, because I had talked to a lot of people before deciding to get this procedure. Technically, I shouldn’t be getting a colonoscopy right now. Fifty is the magical age. But, technically, I should. My dad was diagnosed with Stage 3 colon cancer at 61. His story here. With a first-degree relative, the starting age for colonoscopy is 10 years before the diagnosis or 40 years of age, whichever comes earliest. For me, it should have been at 40. Yes. I’m three years late. IU Health gastroenterologist Douglas Rex, M.D., is a gem of a man. He was my dad’s doctor. He gently prodded me to go ahead and do it. It’s worth it. It saves lives. The colonoscopy – and Dr. Rex – most certainly saved my dad’s life. But it doesn’t make the decision to forge ahead with such a disagreeable procedure any easier. I’d heard horror stories about the prep. I heard people say, “Just plan to feel like you’re not even alive the day before.” I heard people say it was living hell. 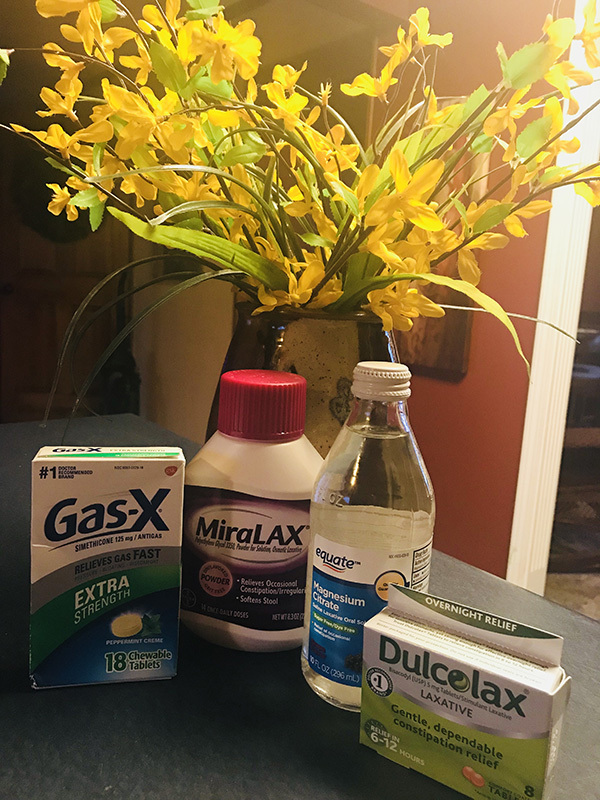 My prep was a traditional one, laxatives, magnesium citrate, Gatorade and more laxatives all the day before – while eating only a clear liquid diet. All last week, those prep tools sat staring at me, taunting me from the kitchen island. They hid underneath a vase of sunny, yellow flowers, ironic, because they were the enemies. It turns out, they weren’t. The prep, my future colonoscopy friends, was not that bad. I won’t get into the details – though if you like bathroom humor like my three boys do – you’ll have to call me. They thought I was a rock star. To make a long story short, I went. I went. I went. And then there was nothing left. And that was good. In the colonoscopy report, Dr. Rex even wrote that I was all clear. The procedure itself went just as smoothly. Dr. Rex welcomed me the next morning. I was wheeled to the procedure room. I woke up in the recovery room and Dr. Rex was beside my bed telling me he found nothing. But come back in five years, he said smiling, with the family history and all. A typical clear colonoscopy yields a 10-year wait. I was grateful and happy that I’d forged ahead and done it. The dread of a colonoscopy seems to be the worst part, the unknown. The reality is the next colonoscopy won’t scare me at all.